For one thing, employees come and go (and change roles) with regularity. Secondly, threats change over time. Thirdly, knowledge and practices that aren’t regularly reinforced will be lost. And, finally, awareness isn’t the same as knowledge. “Just knowing a threat exists isn’t the same as knowing how to recognize and respond to a threat when it presents itself. In-depth education about phishing prevention is needed to create lasting behavior change,” Wombat Security researchers point out. The statistics included in the company’s latest annual State of the Phish report show the difference made by both the tools used to train end users to recognize and avoid phishing attacks and how often they are used. Also, 46 percent of US organizations use those tools biweekly or monthly, while UK organizations do that in just 21 percent of cases. 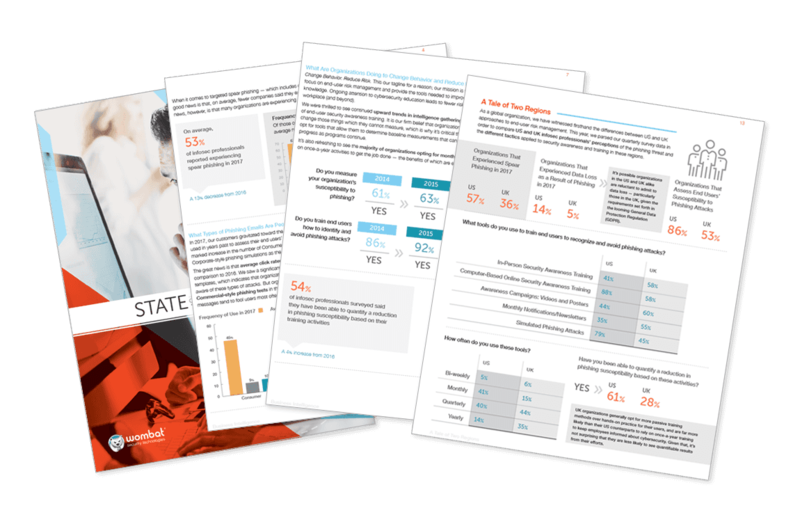 As a result, 61 percent of US organizations see quantifiable results from these efforts, compared to 28 percent of UK orgs. Personalized phishing tests (personalized email address, first name or last name) are no more effective than non-personalized ones. End users are most likely to report suspicious emails in the middle of the week. Two simulated phishing templates had a near 100% click rate: one that masqueraded as a database password reset alert, and another that claimed to include an updated building evacuation plan. Organizations in the telecommunications, retail, consumer goods, government, and hospitality industries have, on average, the worst click rate (15% to 13%), while those in the energy, finance, transportation and defense industrial base industries have the best (8% to 3%). Average click rates fell across all four categories (corporate, commercial, cloud and consumer emails) this year in comparison to 2016. The researchers particularly saw a significant improvement in click rates on cloud-based templates (business-related emails include messages about downloading documents from cloud storage services, or going to an online sharing service to create or edit a document). On average, 53% of infosec professionals reported experiencing spear phishing in 2017. 95% of organizations train end users on how to identify and avoid phishing attacks. 45% of organizations said there are ramifications if their users continue to click on simulated phishing attacks. Consequences include counseling from a manager or IT department, additional training, and removal of access to systems, but also termination (11% of orgs) and a monetary penalty (5% of orgs). Most end users know what phishing is, but only 16% of them know what smishing is. “As more and more employees use smartphones to connect to corporate systems and data, the potential rami cations of an uneducated workforce should not be ignored,” the researchers pointed out.